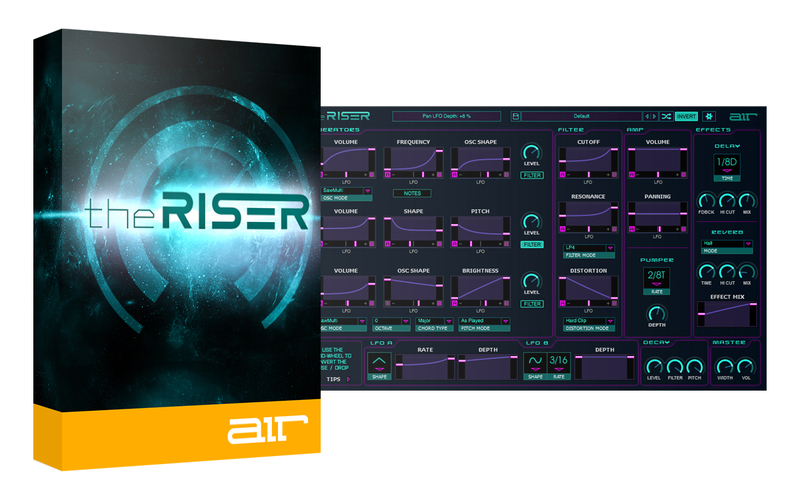 Featuring the most powerful and musical virtual synthesis available, The Riser can be used to create classic transitions or effects never-before-heard by human ears. The core of The Riser’s mojo are three continuously variable oscillators; sweep, noise and chord. Each oscillator features a dedicated Filter send and graphical parameter depiction. Sweep – featuring volume, frequency and oscillator shape – dictates the direction and progression of the transition. Create rises, falls, stops, and swells with audible and visible feedback. Providing volume, shape, and pitch controls, the Noise oscillator infuses texture into your transition. Start shaping to add grit, bite, hiss, punch, and more to the effect. The Riser’s Chord oscillator introduces you to an uncharted creative continent. Use it to match The Riser’s sonic structure to your song’s key (or a contrasting one) and blend it to taste; it can be as musical as you want. Three Low Frequency Oscillators (LFOs) provide additional modulation to your transition. A tempo-sync’d LFO works in harmony with the native song tempo in your DAW to increase the transition’s complexity. The second LFO is free-running, meaning it has not ties to the native tempo. Third, the Pumper effect modulates the synthesis with dynamics control in tandem with track tempo. This pulsating effect adds punch and movement to the transition, and features various time divisions and depth controls for adapting to or accentuating your track. For those looking for turn-key transitions, our team of sound designers have constructed 300 fully editable presets across various types, bringing modern, useable transitions to your project. The Riser offers unequalled flexibility with your current production/composition setup. Available for Mac or PC and in AU, VST and AAX formats, it can operate as an instrument in nearly any DAW such as Logic Pro X, Cubase, Ableton Live, Pro Tools, Sonar, Digital Performer, Reaper and more. It does not require specialty sample players or proprietary software in order to be used in your DAW project – simply call it up when you need it, and use it. Further, you can map your favorite keyboard or controller to the virtual knobs and faders within your The Riser or most DAWs, offering seamless operation with your composition style. We put the essential effects for transition design into The Riser, for fast access to studio-grade audio manipulation heaven. A tempo-sync’d delay with time-division can slap or drench your transition with the subtlety of a feather – or sledgehammer. To add space to your patch, mix in one of 4 reverb types, all of which are completely adjustable to complement your track. To really grab the listener, we incorporated Panning and Width controls, letting you master stereo positioning and intimacy. The Filter section features over 20 types, ranging from low-pass, high-pass, band-pass, multi-pole/pass combos, band reject, and phase shift. When used in concert with The Riser’s LFOs and variable oscillators, you get standout results with signature flair. Experimentation is the key to inspiration, and The Riser gives you a few additional tricks to unlock new sounds. A randomizer will randomly select values for the main parameters to give you that create spark. The Invert mode will reverse the transition, letting you hear it with the direction switched. Rises become falls, swells become fades, and more. 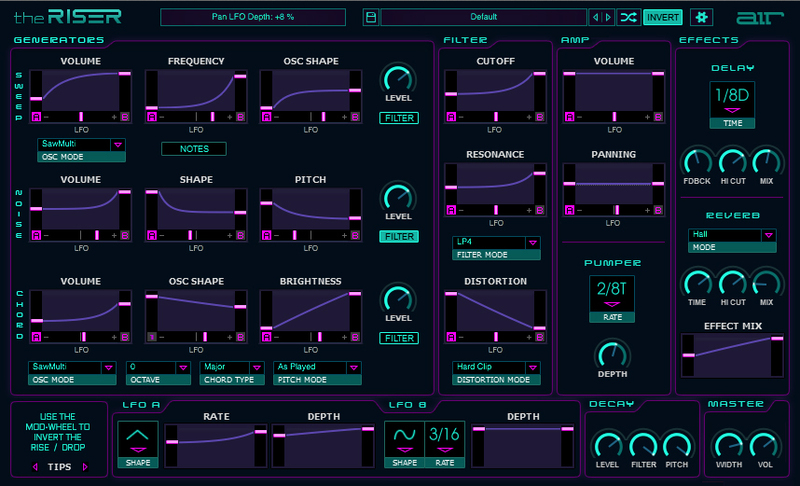 Tap the Swap button and those inversions will override your current setup, making it easy to create complementary patches and save them as presets along the way. We understand the science behind the suspense and emotion that a great transition delivers. Until now, recreating the transition in your head has been a convoluted, manual process. The Riser puts intuitive sound-shaping tools right where you need them so you can design effects that keep the listener on the edge of their seat.